Excellent quality, competitive price, personalized service. Warmly welcome new and old customers . 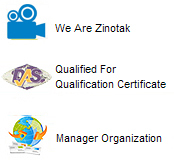 Cixi Zinotak Sealing Manufacture Co., Ltd. is a professional manufacturer engaged in the research, development, production, sale and service of Graphite Gasket, Graphite Packing Ring ,Exhaust Joint Gasket and Reinforced Asbestos Sheet, Reinforced Asbestos Free Sheet ,Reinforced Graphite Sheet.